One of the joys of modelling a specific prototype is researching and then modelling specific trains. The Calder Valley line was the first line to connect Manchester with Leeds, but in the LMS scheme of things Standedge was considered the superior route, latterly providing four continuous tracks. Once Standedge had been developed, the Calder Valley was going to be the lesser route. So apart for the 10.30 a.m. Liverpool Exchange - Newcastle which had a restaurant car and was the regular job for Patriot 45517, the remaining fare was coal trains - loaded westwards, empty eastwards, local passenger and parcels trains. Hall Royd's signature train was probably the Red Bank empty newspaper vans that rattled through at about 17:30 p.m. each evening. This was followed about an hour later by a parcels train heading for Rochdale which latterly carried fledglings from Mytholmroyd. In total contrast to the double headed 22-van train that had rattled through earlier, this would be a Stanier 4 tank and often just a single van (with provision for a guard). The van would be worked forward from Rochdale to Stockport and then to London, whilst 42616 would first take water at Rochdale and then speed back to Low Moor light engine. There can be a little bit of modeller's license, and Hall Royd has a number of might-have-beens. A personal favourite is the January 1958 working of the prototype Deltic taking its spares and consumables from Liverpool via Manchester Victoria to Leeds. The train did run, but sadly went via Standedge. A Class 128 Parcels DMU did visit Todmorden, although its very unlikely to have run beyond, but the Heljan model is a beauty (in the eye of the modeller!). A random purchase of a W&T 6-wheel Palethorpe's van on eBay some years ago has been 'justified' by an article by Tim Shackleton in issue 89 of the 'Model Railway Journal'; although sadly it was a bogie van Tim observed in the lower Calder Valley, which was routed via Huddersfield. So 'our' van has been diverted via Todmorden on its way back to Stockport, Crewe, Wolverhamptoin High Level and finally Dudley Port. The Bachmann Radial has apparently proved to be a best seller. This is very good news, and hardly surprising. It is a nice model of an attractive prototype. So when did the last Radial run down the Calder Valley main line? Two of the Bachmann models were Manningham (Bradford Midland) engines that were latterly dumped at the back of the shed. Noel Coates assures me that all the Radials bar one were scrapped at Horwich so these two will have been dragged at some time through Hall Royd to their final destination. Manningham's 50795 is on LMS suburban rake at Hall Royd; and a reminder I did see 50850 - the last active Radial - at Southport in 1961. One of the problems with superbly detailed steam locos being offered by Hornby and Bachmann is weight - or possibly weight distribution - as some are very effective traction units and others are better on short trains of 3 or 4 coaches. However Hornby's J16 which is now in the advanced stages features a metl boiler, and this got me to thinking maybe the solution was to marry whitemetal kits with the ready-to-run mechanics. Digging around in the back of the stock draws I unearthed a Black 5 scratch-built chassis with Portescap motor that I bought on eBay years ago and did nothing with. A little bit of fettling saw the chassis running again...all that we needed was a body and tender. See how a 'spares or repair' suddenly became a working 45439 literally in a lunch break! Locos shedded at Rose Grove and Lostock Hall are featured on the layout, so to provide a bit of balance long-term Newton Heath resident 44890 has now made an appearance. The Britannias did make an appearance on the Calder Valley, particularly70014 Oliver Cromwell in 1967 and 1968 on the final steam specials. 70000 'Britannia' made her last run in BR service from Moston to Healey Mills with a Teeside-bound freight, being withdrawn from Newton Heath. 70016 figured on the Red Bank empty vans, as caught on film by Richard Greenwood, and 70035 'Christopher Wren' was recorded on a Blackpool-bound excursion. A visit to Loughborough on 30 December 2014 allowed a series of details shots of 'Oliver Cromwell' to be taken. British Railways Standard 7MT 4-6-2 No. 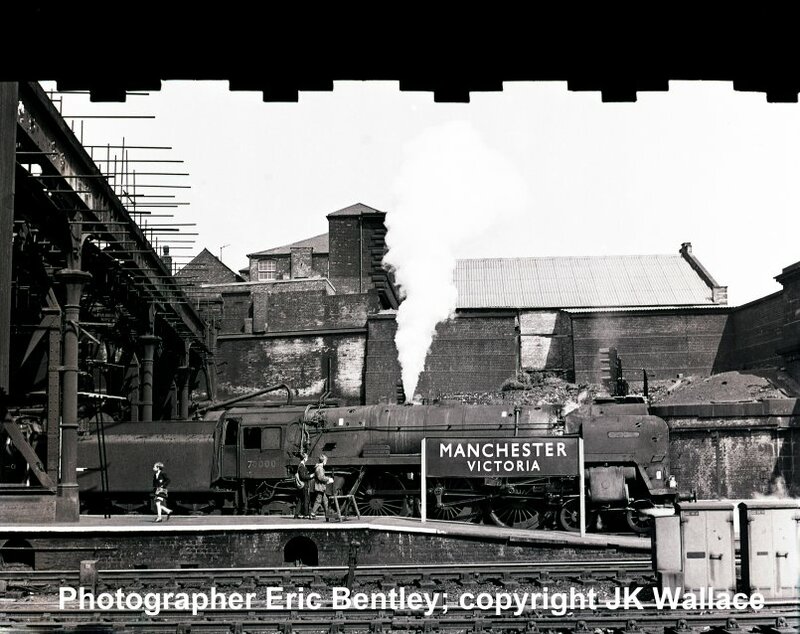 70000, then shedded at 5A Crewe North, arriving at Manchester Victoria at 10.35 a.m.on Saturday 5 June 1965. Currently we have no evidence of an Ivatt Class 2 2-6-0 appearing at Hall Royd, but the existence of a rather nicely built DJH kit does mean one will appear on the model. So the opportunity to capture a series of detail shots of 46521 at Loughborough on 30 December 2014 was taken. The ex-LMS Stanier 8Fs were very much in the picture at Hall Royd Junction, particularly in the latter years of BR steam. In the early BR-era the Midland inspired Austin 7s or G3s were regular performers, but were withdrawn in preference to the large number of WD 2-8-0s that BR acquired post-war. The WDs did remarkably well, with the last one going in 1967, which left the 8Fs as the primary Calder Valley and Copy Pit freight and banking motive power. A visit to the Great Central Railway at Loughborough on 30 December 2014 found two Stanier 8Fs in residence. 48305 was fully dismantled for overhaul, whilst maroon 48624 was available for a more detailed inspection. I'm both a traditionalist and a realist. I like my locos in authentic condition: I also like to seem them working and earning their keep. In February 2015 48666 - famous for being the last BR steam loco to derail itself on 3 August 1968 - entered service at Hall Royd Junction. The last stamping ground for LMS express passenger steam was Copy Pit, with Low Moor's small fleet of Jubilee's working heavy summer excursions to Blackpool in the mid-60s, and 45565 'Victoria' has now - after a long gestation - finally joined the active fleet. When people are asked to name British Rail's most successful trains, they tend to think of the HSTs or the Mark 3 carriage. Both remain today in front line service, and as these notes are penned, are due to have a new lease of life in Scotland as 'super powered' short formations. You can generally judge a design by its life expectancy, and it could be suggested that the poor old Pacer has been just as effective, and also deserves a place in our virtual railway museum. So many photographs - particularly of the north - in the last 30 years or so feature a Pacer (although not generally as the subject). They also form an important part of the Hall Royd story and I am grateful to Chris Haley for contributing a couple of shots showing Pacer 55806 completing the reversal that was required as there was not a cross-over at Hebden Bridge.